Powers/Abilities: Feral powers - heightened senses, superior strength and agility. History: "You, Vixen, shall become a hunter-killer without passion - a woman not restricted by any morals." Noted scientist Professor Beaumont and his assistant, biologist Vivian Gale, are sent by the Australian government to investigate sightings of a U.F.O. near the Mawson base in Australian Antarctic Territory. They stumble across the alien craft during a blizzard, and board the vessel. They discover a cylinder residing in a chamber within the vehicle, and are examining it when the craft springs to life. They grabbed the object just before the ship ejected them and shot off into the sky. The two scientists returned to Australia to examine their find more closely, but when it was left unattended in Vivien's lab, the cylinder sprang to life and bathed her pet fox with a scanning beam. Returning to her lab, Vivien was subjected to a similar scan. Shortly afterwards Vivien was shot trying to stop foreign spies from stealing the device, which then activated and transported her into the alien vehicle. 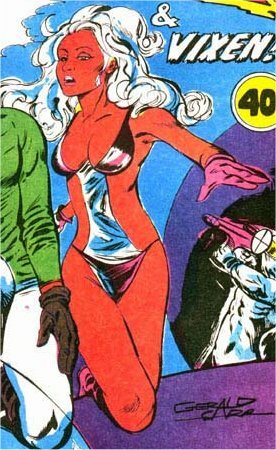 There the aliens used the information the probe had gathered to save Vivien and transform her into the superheroine Vixen. Comments: Created by Gerald Carr. 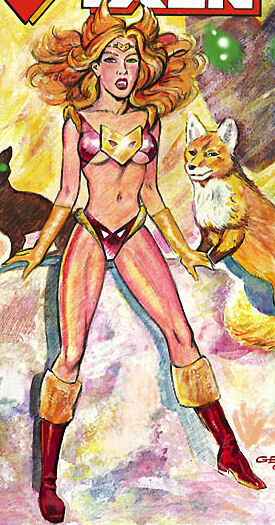 Thanks to Dennis Ray for the more recent image of Vixen.